There’s plenty of guidance and advice available if you’re a professional who is wrestling with writer’s block, or who wants to know which sections a psychology journal paper should contain, or who is idly wondering whether the colon they’ve just typed should be followed by uppercase or lowercase. Why do I keep getting low marks even though I write lots of relevant stuff? Is this good enough to get a decent mark? Is this good enough to even scrape a pass? Will I manage to finish this wretched thing by the deadline? This article provides some help for stressed-out human beings in those situations. Most people try to write something by starting at the beginning and then keeping going till the end. That’s logical, but it often goes astray. You might find it more helpful to view writing as a set of different activities that you do at different times and in different ways. So, for example, one activity involves writing boilerplate text, which is solid and worthy and true and doesn’t need much inspiration or brainpower. Another, very different activity, is adding clever things and pixy dust, which usually involves a few minutes of work at a time, at times when your brain is bright and fresh and on form. With this approach, you can tackle different activities at different times, to match the state that you’re in and the time that you have available. It’s flexible, it’s practical, and it’s good for reducing stress levels and for raising the quality of your work. I’ll go through them one by one, with a diagram for each one. The diagrams will make the article look long, but the actual text is pretty short, so you should be able to read it in a few minutes. I’ll use this standard layout for each diagram. 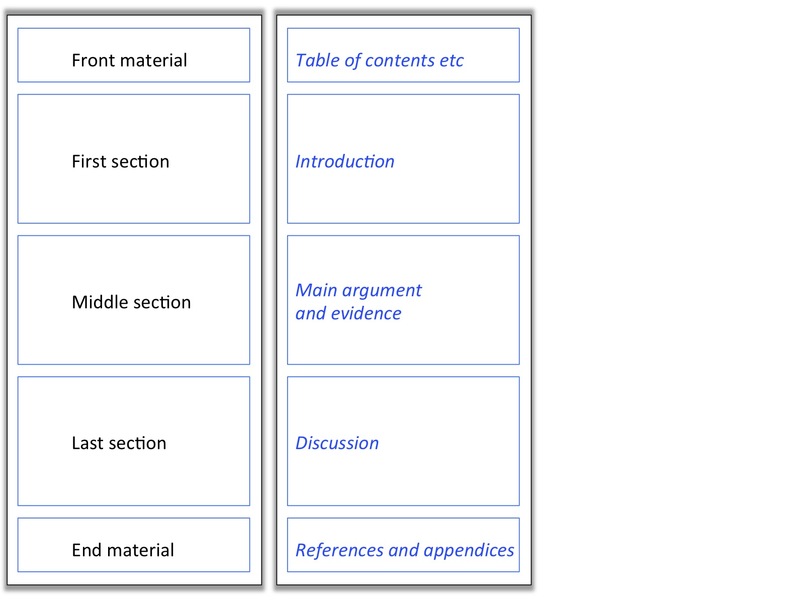 It maps fairly neatly onto widely used formats for essays and for academic papers, which begin with front material, then have the main material in the middle, and then end with references, appendices, etc. I’ll also use colour/greyscale to make it easier to keep track of what’s going on. Here’s what that looks like schematically. 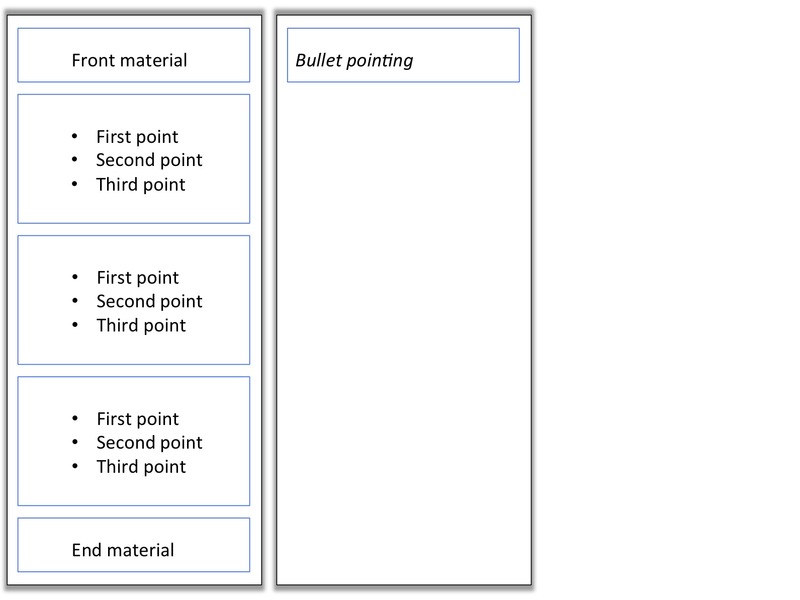 Brutal tip: If you run out of time, submitting something with bullet points in one section is a lot better than submitting something without any text at all in that section. This is text that tells the story and gives the information the reader needs. It’s true and it’s necessary, but it’s not something that shows brilliance. For instance, if you’re writing about the use of social media, then you’ll need to write boilerplate text saying what social media are, and describing some examples. 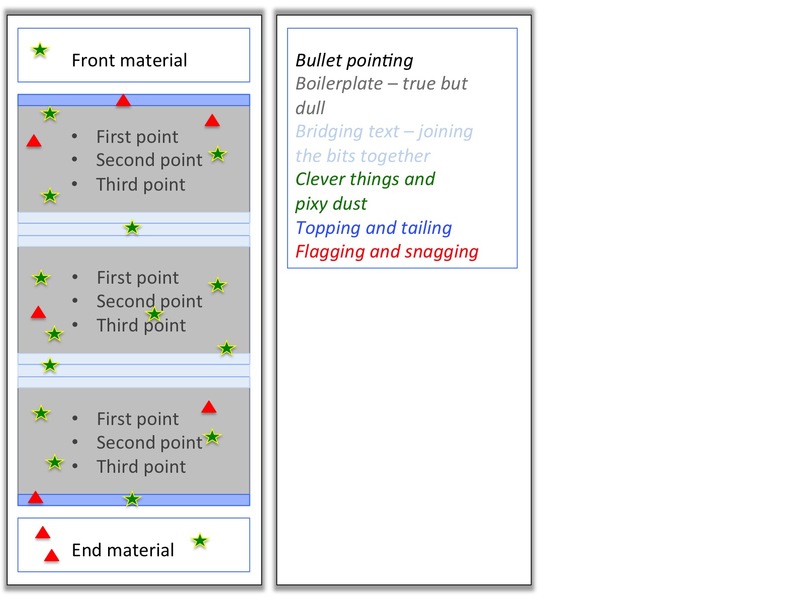 A lot of the text in a typical piece of writing is boilerplate, as shown by the grey sections in the diagram below. 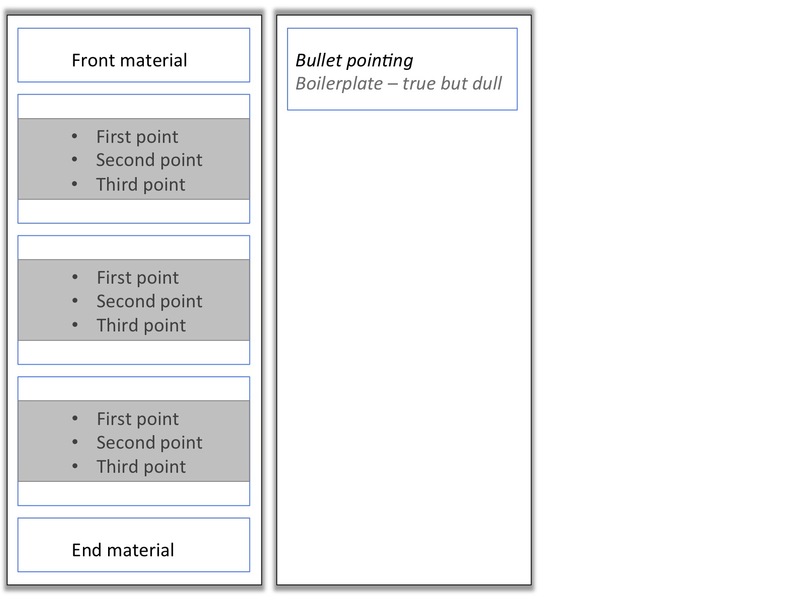 Writing boilerplate text takes time, but doesn’t need brilliance. Bridging text smooths the transition between sections, so the reader can see more easily where the story is going. Bridging text doesn’t take long to write, but you do need a clear head, and you need to know exactly what the key points are that you’re trying to make. It’s easier to write bridging text once you’ve finished at least one of the pieces of boilerplate that you’re joining. These are chunks of sparkingly brilliant stuff worthy of good marks and praise. It’s a good idea to go through your text systematically looking for places where you can sprinkle pixy dust; you should have at least one fleck of pixy dust in each section, and preferably as many as you can cram in. This is like bridging text, except that it’s at the beginning and at the end. It’s usually a good idea to write the conclusion before you write the final version of the introductory page. This is because you’ll probably realise things while you’re writing the conclusion that you’ll want to mention in the introduction. Flagging involves preparing the reader for something that comes up later. For instance, if you’re going to bring in some unusual concept half-way through your essay, it’s a good idea to flag it early in the introduction, so it doesn’t come as a total surprise to the reader. Snagging lists are intended for yourself, to help you keep track of things you need to remember. They include lists of things to check, information to find, things to fix, and so on. They’re useful because if you spot a problem while you’re writing, you can just add it to the snagging list to fix later, rather than trying to fix it immediately because you’re worried about forgetting it. If you have a few minutes free and you want a small manageable task, then tackling an item from the snagging list will probably give you a feeling of progress without needing too much brainpower or effort. On which encouraging note, this article ends. There’s more about academic writing in The Unwritten Rules of PhD Research, by myself and Marian Petre. This entry was posted in craft skills, hints and tips and tagged academic writing, pixy dust, snagging list, writing tips by hydeandrugg. Bookmark the permalink. Great article, which I shared with my students.